PHUKET BUSINESS: The Indigo Pearl Resort, born in 2007 after the then rather tired Pearl Village received a radical makeover, is about to go through another radical change, taking it up another notch. 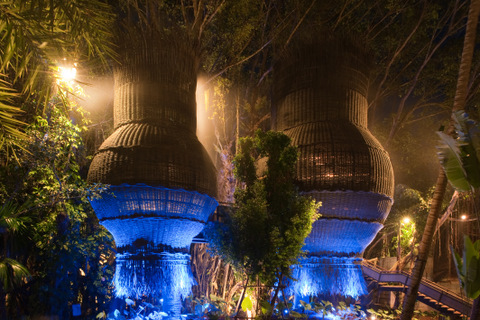 The resort’s bizarre spa, Coqoon, has won multiple awards – an example of designer Bensley’s view that ‘the odder, the better’. This time, designer Bill Bensley – who was behind the tin-mine theme the resort is now famed for – has been given the task of turning it into an all-villa-and-suites resort. The multi-million-dollar remake will see the property offer a number of exclusive pool and spa villas ranging from 550 to 2,500 square metres in area, with the reopening set for around November this year. Meanwhile the resort continues to garner awards. At the International Hotel & Property Awards 2011, held in Monaco and hosted by leading UK-based interior design magazines Luxe et al and design et al, it got two more: best design spa for its Coqoon Spa, which hangs in the branches of a huge banyan tree; and best design suites for its accommodation, including the designer Pearl Bed Suites, recently conceptualised D-Buk Suites, the Pool Pavilions, and the seven individually styled Pearl Shell Suites. This is the third time this year Indigo Pearl has won awards for its unique design. The designer suites and cutting edge Coqoon Spa are the work of leading designer Bill Bensley, best known for his holistic approach of integrating structures with nature while embracing local art forms. Bensley is on record as saying that his philosophy aligns with the Indonesian phrase “lebih gila, lebih biak”, which translates as “the odder, the better”.